Crossovers Wallpaper: One Battle. One Winner. Minitokyo »	Crossovers Wallpapers » Crossovers Wallpaper: One Battle. One Winner. I added dots texture and white gradients on the background to make the two main characters stand out more among the mess..
ZOMGWTFHBBBQROFLMFAO. ARE YOU KIDDING ME!?! One thing stands out above all the rest, and that is "You just came up with the background on the fly?" The main scan speaks volumes. It's by far one of my favorite that has come from the Persona 4 Arena section of scans, and is by far one of the coolest crossover scans in the entirety of the Persona series. While having the least amount of character, it speaks in great lengths in terms of depth and action. You've managed to that scan, and make it into something not only memorable, but something Atlus would be begging to use for an ad poster for P4Arena. There's one thing I really like about this wall more than anything else, and that is that you let the scans themselves do the talking. With just simple but incredibly effective enhancements to the originals, you really let the original images speak strongly. The use of lines to create additional movement was very subtle, but it greatly helps in the overall action segment of the scan itself. I especially love the enhancement of color to create further depth and shadowing. 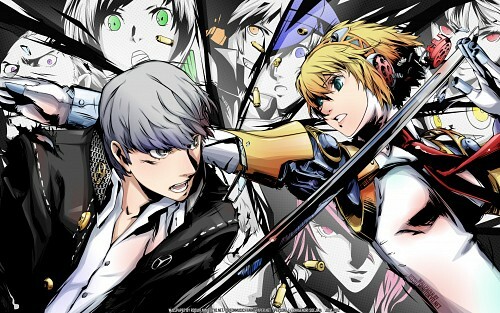 I cannot stress enough how that great coloring really takes the images of Yu and Aegis and really pushes them beyond. For the background itself, I still have a rather difficult time believe that you simply came up with this on the fly. From the clever use of color that relates to the actual content in the Persona games, to re-cutting the background with those awesomely strong black lines to make some faces whole, and cutting off others like Yosuke to give it this sort of coolness. I seriously cannot stress how much I love the sparingly use of color, the great idea of the dots/halftones/whatever-they're-called-I-ca(...) It's like this background was completely designed from the beginning to go with that scan. Everything fits so nicely, and yet at the same time nothing feels cluttered or overwhelming. It really shows how great of an eye you've got for design and more importantly, how easily you can make it look to come up with something so uniquely creative. Honestly, I love this piece. It's no stretch to say that this is by far the strongest Persona wall ever made, and the gallery holds within a lot of extremely incredible pieces. You really outdid yourself with this one in my book. Now if you'll excuse me, I need to go reserve Persona 4 Arena and Golden. Wow this is so cool. So much is going on, yet it doesn't feel cluttered. The colors remind me of comic books and that's always a plus. This is definitely my favorite of yours so far. Nice work, Persona4 , i hope the game is not that bad. i don't usually comment but this is amazing love it thanks for the share. Love the whole persona series and this wallpaper look great! Excellent job! Love how much more detail, color, and clarity you added to the main scan. And the angle you put it at really makes it even more dynamic. :D Looks like an exciting superhero comic! I would say that just the green character in the bg kinda distracts attention from the main two - dunno if it's because of her expression or by how bright she is, but my eyes always end up going to her. @. @ Also, love the halftone dots in the bg too! I'm in love with the bold outlines. one of the best P4 and p3 wallpapers EVER! oh man, this is beautiful. Nice wallpaper, I should say.